The Dutch Masters no doubt would swell with pride knowing that exquisite recreations of their works, produced in cooperation with the nearby Rijksmuseum, hang on the walls of this classic and elegant city-center hotel. 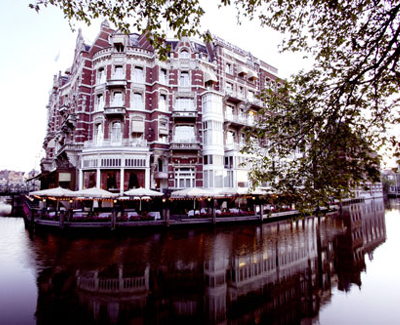 There's something wonderfully iconic about this distinctive-looking Amsterdam landmark, which has seemingly anchored itself to a hairpin bend on the beautiful Amstel River. And how appropriate, since the owner of De L'Europe is the Heineken family, and Amstel is one of their top-selling beers. The hotel itself, however, lies distinctly toward the champagne end of the spectrum, with luxurious touches and cutting-edge comforts that defy the location's humble beginnings as a modest inn, back in the early 1600s. These days, you'll be treated to a selection of stylish guest rooms and suites in the original Rondeel Building—built in 1895—that are swathed in bold wall colors and elegantly finished with custom fabrics, fine linens, and marbled baths. Or you can opt for one of the 23 contemporary suites in the brand-new Dutch Masters Wing, which offers separate entrances for privacy and an indoor heated pool with panoramic, eye-level views of the river. Wherever you cozy up, you'll find thoughtful amenities. Relax with a cup of espresso from your in-room Nespresso machine. Plan your day with ease using your personal iPad. And venture to the bathroom at night with confidence—when you set foot to the floor beside your bed, motion-detecting floor lighting leads your way. Every nook and cranny of this classically refurbished hotel is worth exploring, from Freddy's Bar—a legendary Amsterdam watering hole named for Alfred Heineken—to Bord'Eau, a jewel of haute-cuisine dining in an exquisite, salon-like setting. You'll want to linger over a fine label at Les Caves De L'Europe, the hotel's private wine cellar, or perhaps sample a fine cigar at Freddy's Fumoir, which also offers a selection of cognacs. Above all, don't miss the sophisticated "see-and-be-seen" crowd at the hotel's grand Promenade, the perfect spot for a nightcap after enjoying the delights of Amsterdam.